Imagine hearing the sound of your own voice, or the voice of a loved one, for the very first time. For those of us who have always been able to hear, that's hard to do. But have a look at this video montage showing hearing-impaired people hearing for the first time (above). When you see the profound joy that washes over their faces, you'll never take your own hearing for granted again. 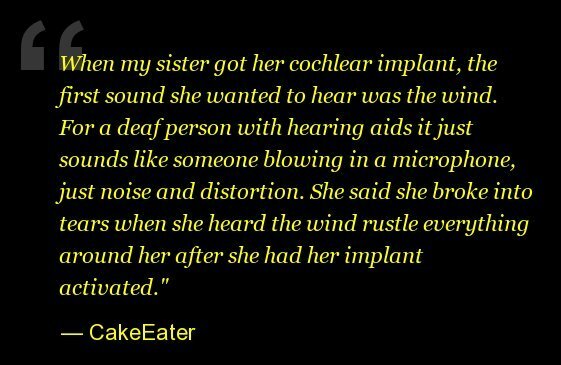 The videos feature people trying out their new cochlear implants, which are small, surgically implanted electronic devices that pick up and process sounds, and then deliver them straight to the brain. According to the American Speech-Language-Hearing Association, more than 219,000 people worldwide have received cochlear implants. What a great example of how science is working to make the world a better place!